Another season of Agent Carter has ended. Despite a much stronger beginning to this second television outing for Peggy Carter, my feelings aren’t really much different than they were before. Peggy Carter is a great character. Hayley Atwell is simply extraordinary—if you haven’t watched her episode of Black Mirror, then you’re missing an incredible performance that manages to stand out as a small part of probably the smartest show I’ve seen in decades. Agent Carter should easily fill in more Marvel Cinematic Universe backstory with a fun sense of history, add further depth to Captain America, and provide the genesis for Agents of S.H.I.E.L.D. (why we’ve had two whole season and the S.S.R. hasn’t become S.H.I.E.L.D. is beyond me) Mind you, all this while still giving the audience a strong, female character with real agency. But...the show doesn't quite manage that...so I like the idea of Agent Carter as a character—honestly, I’m stunned she’s not staring in a ton of other spinoff material with Jarvis as her sidekick—but the execution continually leaves an awfully lot to be desired. My issue with season one come down to a couple of big things. I thought they overplayed the sexism angle to the point where the male characters became meathead caricatures. Not only does that cheapen Peggy’s strength but it ignores the background of the character as established by Captain America and the fact that this isn’t meant to take place in the our world, this takes place in a world with superheroes. A lot of the time, the sexism is doubly frustrating because it felt like it os being done to easily make Peggy appear stronger and to pad light episodes. As the audience, you repeatedly sit through 15 minutes of Peggy sneaking around playing detective, only to have to turn right around and sit through 15 more minutes of the boys’ club playing detective to find the exact same information. Literally, you, as the audience, get nothing else out of it. Also, for a show that is supposedly feminist and presents us with a strong female character, everything about Agent Carter’s first season was about men. Peggy worked with men. Peggy reported to men. The main villain was a man. The main plot was about a man. Peggy’s sidekick was a man. Hell, even Peggy’s character focus was her grief over a man. But mostly, the really disappointing thing about the first season? It tends to be boring and terribly paced. Unfortunately, that's a trend that continues through the second season. Everything, again, hangs on men (even Whitney Frost's power hangs on men—hell, she even needs a man to give her power a supercharge), but the pacing was probably the show's biggest problem, And, I think, ultimately, that was the ratings downfall. First, what was the main plot? The secret council that runs everything—yawn? Zero Matter—what exactly is it supposed to do again? The evil machinations of Whitney Frost—who never really manages to feel like a threat? Whic man will Peggy choose as a boyfriend? Well, that depends on the episode and, in some cases, which part of the episode. After the initial couple of episodes, I was mostly bored. Just plain bored. 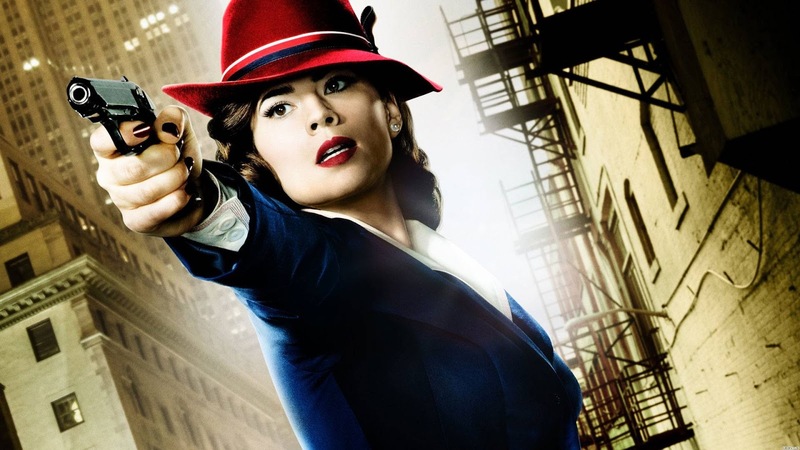 As a midseason replacement, Agent Carter is a show that really needs laser focus. That’s not to say that you can’t have character stuff going on, but the show needs a solid and clear plot that advances every episode. Season two felt mostly directionless to me. The addition of the two extra episodes didn’t help anything at all. The last four or so episodes were especially terrible. Things would finally seem like they were coming to a head and rolling to a big, exciting climax…only to fizzle out and lead into 20 minutes of aimless dialogue and a sudden refocus on something you didn’t remember or even really care about. Unfortunately, fighting through my boredom didn’t really get me anywhere. Nor did putting off watching the last episode for two weeks. The finale was spectacularly dreadful and not just because of the stupid cliffhanger. Again, for a show that’s supposedly about a strong woman doing strong woman things, the day cannot be saved until womanizer Howard Stark arrives to super science the show to an unsatisfying ending that leaves Whitney Frost in an asylum--because, hey, we all known how crazy these women can be. Am I right, fellas? Am I right?